I was reminded recently that not all the people who read this blog might be familiar with some of the terms, acronyms or abbreviations that I might use in my writing. So, I thought I’d start a list of definitions or explanations that some people might find helpful. The list often includes a link to a more detailed explanation elsewhere on the Internet in case you would like additional information on the subject. If I use a phrase or abbreviation that you are not familiar with, please drop me an email at tracy@aroundthepattern.com and I’ll do my best to give an explanation and then will add it to this list for future reference. ACARS : Aircraft Communications Addressing and Reporting System. A datalink system for the transmission of short, simple messages between the aircraft and ground stations. It is used to transmit company position reports, to receive enroute weather, airport weather conditions and forecasts and to pass information to the departure and arrival stations. ADS : Automatic Dependent Surveillance. A system that automatically sends aircraft position information via datalink to connected ATC centers. System operation is transparent to the flight crew. AGL : Above Ground Level. An aircraft’s height above the terrain. See also MSL. ALPA : The Airline Pilot’s Association. A union for professional pilots. AOM : Aircraft Operating Manual. The airline I work for has this manual in two volumes. Volume I includes expanded explanations of the preflight inspections, checklists, Standard Operating Procedures, Standard Maneuvers and Configurations, International Operations and Aircraft Performance. Volume II includes explanations of the mechanical systems found on the airplane. APD : Aircrew Program Designee. A pilot working under an airline training program who has been given the FAA’s blessing to conduct type-rating evaluations in the aircraft for which he/she is rated. APU : Auxiliary Power Unit. A small jet engine usually located in the tail of the aircraft which is capable of providing electrical and pneumatic power to activate the aircraft’s systems. Bleed air from the APU is used to power the air conditioning systems on the ground and to start the main engines. ATIS : Automatic Terminal Information Service. A means by which aircraft approaching an airport may obtain the latest weather conditions and runway in use at the airport. A recording is available over the appropriate radio frequency or a printed version may be available via datalink. ASES : Aircraft, Single-Engine Sea. CAFE Foundation : CAFE is an acronym for Comparative Aircraft Flight Efficiency. The CAFE Foundation is a non-profit, tax-exempt organization which creates and advances the understanding of personal aircraft technologies through research, analysis and education. The CAFE team arose mainly from members of Experimental Aircraft Association Chapter (EAA) 124, where the passion for personal aviation is strong. Volunteers from EAA 124 (Santa Rosa, CA)have formed the backbone of CAFE’s success. CAFE Foundation website. Cat I/II/II minimums : Instrument approach minimums specifying the minimum weather required to fly the approach. Precision (ILS) approach minimums are usually require only a minimum visibility. Cat I approaches generally require an RVR of 1800′ or a half mile. Cat II approaches, in general, require an RVR of 1200′ or 1/4 mile, while Cat III C approaches have no visibility required for an autopilot/autoland approach (There are incrementally lower visibility requirements for Cat III A, B and C approaches, with C being the lowest). CBs : Cumulonimbus clouds. Some good examples can be found here at weather pictures. CBP : U.S. Customs and Border Protection. COM : Cockpit Operating Manual. A manual carried in the pilot’s book bag which includes the checklists and troubleshooting processes for aircraft systems malfunctions, emergency procedures and supplemental information concerning abnormal operations, such as dispatch without an operating APU. CPDLC : Controller-Pilot DataLink Communications. Communications between the flight crew and an ATC controller using text messages transmitted by datalink. The messages are largely pre-formatted. DA(H) : Decision Altitude or Decision Height. The altitude on a precision instrument approach at which the decision must be made to continue the descent to landing or to execute the missed approach procedure. 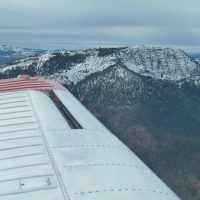 The aircraft will usually descend below this altitude in the transition from descending to executing a climb associated with the missed approach. DH : deadhead leg. A leg of a trip or rotation during which the crewmember rides as a passenger. Deadhead legs are used to preposition a crew member to a location where they will be part of a working crew. DH legs are found in scheduled trips or are found on trips generated as a result of equipment substitution, weather disruptions or sick calls where the originally scheduled crew member is no longer able to fly the subsequent flight. DNIF : Duty Not Including Flying. A military term describing the work status of a military pilot who is too ill to fly, but not too sick to work at other jobs he/she may have been assigned. EAA : Experimental Aircraft Association. An international aviation organization based in Oshkosh, WI. EAA has divisions dedicated to amateur building aircraft, warbirds, light sport aircraft and sport pilots, ultralights, and flight instruction. EFC : Expect Further Clearance. Information given to an aircraft which has just been given holding instructions. It is a time in the future that the aircraft can reasonably expect to be given instructions to exit the holding pattern and proceed to the destination airport. EGPWS : Enhanced Ground Proximity Warning System. A system installed on transport-category aircraft that uses a worldwide database of terrain coupled with the aircraft’s gps-derived position to provide a predictive warning of terrain ahead of the aircraft which may become a threat considering the aircraft’s current heading and altitude. ELT: Emergency Locator Transmitter. A radio transmitter carried on most general aviation aircraft that broadcasts a signal in the event of an aircraft accident. ELT use was mandated by the FAA in 1973, requiring units that broadcast their signal on two emergency frequencies (121.5 and 243.0 MHz). These emergency frequencies were monitored by the international COSPAS-SARSAT satellite system. This type of ELT is prone to false activation and, as a result, has been replaced by a newer digital version broadcasting on 406 MHz. In Feb 2009 the satellite systems stopped monitoring the lower frequencies while retaining surveillance of the 406Mhz signals, however replacement of the older units has not yet been made mandatory in the U.S.
FMS : Flight Management System. An integration of aircraft sub-systems through Flight Management Computers which aids the pilot in controlling the aircraft by eliminating the need for many routine tasks and computations. It provides automatic navigation, performance optimization and automatic fuel monitoring as well as providing the information for the primary and navigation flight displays. GPWS : Ground Proximity Warning System. An aircraft system which monitors the aircraft position and flight configuration in order to provide the pilot an aural and visual warning of an unsafe flight condition. Various modes of the GPWS system check for excessive descent rates, altitude loss after a take-off or go-around, glideslope deviations while on an instrument approach and excessive closure rates with terrain. the GPWS system uses inputs from the barometric and radio altimeters as well as landing gear and flap position sensors. An Enhanced version of the system (EGPWS) uses Global Positioning (GPS) and a worldwide terrain database to provide a greater warning time due to it’s “look ahead” ability. HF : High Frequency communications radio. Used to communicate with air traffic control agencies when out of VHF communications radio range using the frequency range 3 – 30MHz. Newer model aircraft are now using datalink systems for this purpose. See CPDLC. Here is Wikipedia’s discussion of HF. IA : Inspection Authorization. A designation given to FAA certified aircraft mechanics who have qualified for and successfully passed additional written and practical tests that prove to the FAA that the individual is capable of certifying an aircraft airworthy. All general aviation aircraft (except amateur-built, which have Condition Inspections) must be inspected annually by a mechanic holding an IA who then certifies the aircraft airworthy and in compliance with all applicable regulations. ICAO : International Civil Aviation Organization. The international version of the US Federal Aviation Administration (FAA). LOC : Localizer Approach. The non-precision approach associated with the precision ILS approach. This approach is used when the glideslope portion of the ILS is out of service for some reason. The LOC approach provides localizer directional guidance to the runway, but the descent portion of the approach must be accomplished in accordance with non-precision approach procedures. LSA : Light Sport Aircraft. MAP : Missed Approach Point. A point on an instrument approach where the aircraft must either transition to a landing or execute a missed approach. MEL : Minimum Equipment List. A list if items on an aircraft that specifies if the item need be operational for the flight and, if not, how to document the discrepancy. MDA : Minimum Descent Altitude. Minimum altitude to which and aircraft may descend on an instrument approach without having the ground references necessary to continue to a landing. Usually associated with a non-precision instrument approach. MMEL : Master Minimum Equipment List. A Master list of aircraft equipment compiled by the aircraft manufacturer and the FAA which may be used to develop a working MEL for a specific make and model of aircraft, tied to that aircraft by it’s serial number and registration. MSL : Mean Seal Level. The height of an aircraft above mean sea level. Read on the aircraft’s altimeter when the local altimeter setting is placed into the altimeter’s Kohlsman window. NAT Tracks : North Atlantic Tracks. Organized flight tracks, similar to domestic airways, that stretch from the northeast part of North America to Western Europe. The organized track system provides lateral and vertical separation in the heavily traveled North Atlantic region between FL290 and FL410. The routes are controlled by Gander and Shanwick Oceanic Centers. The specific navigational points change daily and are designed to provide the shortest flight times between the two regions. NRT : Airline identifier for Tokyo’s Narita International Airport. The ICAO identifier is RJAA. OE : Operating Experience. Airline pilots receive type ratings in aircraft based solely on simulator training. Operating Experience on actual revenue flights with an instructor finish the aircraft qualification process. PIREP : Pilot Report. A report given to Air traffic Control or company weather personnel concerning the weather encountered at a navigation reporting point or when unexpected weather phenomenon are encountered, such as turbulence. PVG : Airline identifier for Shanghai, China’s Pudong International Airport. The ICAO identifier is ZSPD. RA : Radar Altitude. Refers to a minimum altitude on an instrument approach determined by the indication of the radar altimeter rather than the barometric altimeter. Usually associated with Cat II/III approaches. RVSM : Reduced Vertical Separation Minimum. Reduced vertical separation (1000 ft) between qualified aircraft flying above FL290. The FAA web site explaining RVSM may be found here. RVR : Runway Visual Range. A weather term referring to the visibility distance in feet or meters measured by optical instruments (transmissometers) placed next to and aligned with a given runway. One or more measurements are usually provided, such as the touchdown (TD) zone, runway mid-point (MID) and rollout area (RO). If one value is reported it refers to the visibility measured in the touchdown zone. SATCOM : Satellite Communication. Telephone-type communication between the aircraft and a ground station using a satellite relay system. SIGMET : A weather advisory containing information applicable to ALL aircraft. There are two types – non-convective and convective. A Non-convective Sigmet will be issued for forecasts covering an area of at least 3000 square miles and containing severe or greater turbulence, severe or greater icing or IMC due to dust, sand or volcanic ash. A Convective SIGMET is issued for an area of thunderstorms affecting an area of at least 3,000 square miles, a line of thunderstorms at least 60 nm long, and/or severe or embedded thunderstorms affecting any area that are expected to last 30 minutes or longer. A Convective SIGMET is valid for 2 hours and they are issued every hour + 55 min. TCAS : Traffic Collision Avoidance System. An aircraft-based display of other aircraft in the vicinity of yours. Traffic displays are usually restricted to other aircraft within a specified number of miles and a specific number of feet above or below your aircraft, depending upon the installation. More information. When an ‘intruder’ aircraft enters the system’s alert area, TCAS will issue a Traffic Alert (TA) drawing the pilot’s attention to the traffic. If the intruder aircraft continues on a collision course and gets within the aircraft’s protected zone, the TCAS system issues a Resolution Advisory (RA) which directs the pilot to take specific avoidance actions. TPE : Airline identifier for Taipei, Taiwan. The ICAO identifier is RCTP. UHF: Ultra-High Frequency. A communications radio that uses frequencies in the range 300 – 3000 MHz (3 GHz). these radios are used primarily by U.S. military aircraft. VHF : Very High Frequency. A communications radio which uses frequencies in the range 118.0 – 137.0 MHz. 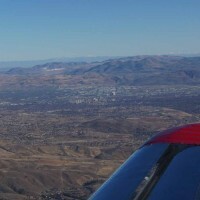 VNAV : Vertical Navigation. 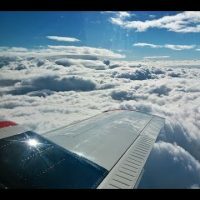 A function of the autopilot which commands the aircraft to climb, descend or level off as directed by either the pilot through settings made on the autopilot control panel or automatically through the settings inserted into the Flight Management System (FMS). "Pilots take no special joy in walking. Pilots like flying."